U.S. President Donald J. Trump has threatened to pull out of the nuclear deal with Iran. But he has a range of options at his disposal as he makes his decision this week on whether to scrap the 2015 accord to curb Iran’s nuclear program in return for lifting sanctions. The U.S. president already refused last October to “certify” the action plan signed by Iran and the five major world powers — the United States, Russia, China, France and the United Kingdom, even though international inspectors confirmed the Islamic Republic was meeting its obligations. But that “non certification” was largely symbolic. The decision he is due to make by Saturday will have real repercussions. In return for steps taken by Iran, Washington suspended sanctions imposed on the country over its nuclear program. But U.S. law requires that the president decides on whether to renew that suspension every 120 to 180 days. Saturday’s deadline is only focused on the suspension of some specific sanctions, including those aimed at the Iranian central bank and Tehran’s oil sector. The suspension of the majority of the remaining sanctions will remain in force until mid-July, which gives Trump a number of options. This is the least likely outcome, since Trump appears determined to maintain his tough stance on the issue. But if he wants to give a chance to France’s idea of a “new deal” with Iran, he could push back the showdown, at least until July. Trump could, if he so desired, reimpose all the sanctions lifted under the 2015 deal in one fell swoop. He could even slap new sanctions on top of the old ones. That would constitute a bold step toward ripping up the deal, since Iran would no longer feel obliged to meet its own commitments. Trump can also choose to play on the complexity of American legislation to build pressure on Iran and the Europeans, while trying to avoid delivering any sudden death blow to the deal. That is what many observers see as the ideal path, even though it is difficult to see exactly where the changes might come. He could for example reimpose one tranche of sanctions, of greater or lesser importance, while threatening to renew the rest if no effort is made to harden up the agreement. He could also use legal subterfuge to re-establish sanctions while changing how they are applied. Or he could slap different sanctions on Iran which are ostensibly not linked to its nuclear program — although there is a risk that Tehran may see that as a violation of the agreement. “The president may conclude that a big muddle is his best option,” said Jon Alterman, director of the Middle-East Program at the Center for Strategic and International Studies. “Uncertainty over what the United States will do would seriously inhibit foreign investment in Iran, which seems to be an administration goal,” he said. The Europeans have said they will stick to the agreement even if the United States withdraws. But some diplomats worry about what European companies that have invested in Iran will do — shaken by uncertainty and threatened by U.S. sanctions, they may well decide to freeze or even drop their investments, thereby hardening the Iranian position. To that effect, experts will be examining any decision that may, on the surface, seem technical but which could have severe ramifications — will Trump re-establish measures that could punish European or Asian firms that have business dealings with Iranian companies? That will have a marked impact on the European response, and ultimately, on Iran’s reaction. 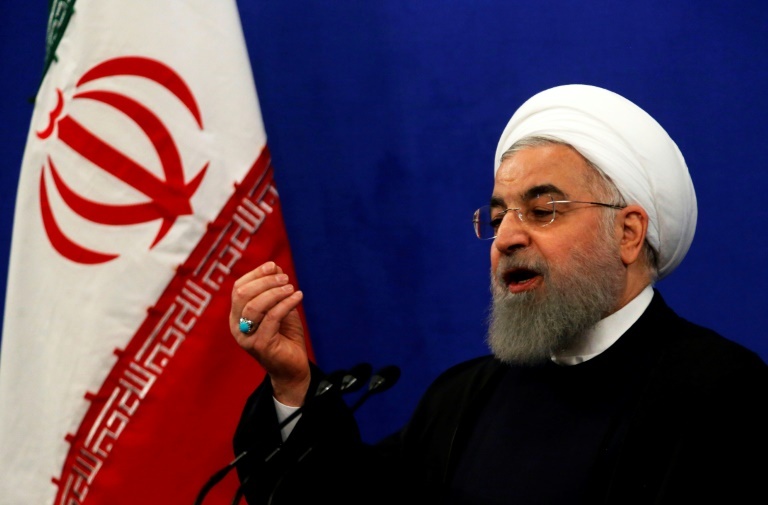 The Iranian leadership has sent out contradictory signals, ranging from wanting to abide by the deal even without Washington, to renewing and accelerating its nuclear program. Tehran’s tone has hardened in recent weeks, leaning towards the threat to quit if the U.S. pulls out. But, if the 2015 deal collapses, international inspectors will not have the same access to verify the Islamic Republic’s nuclear program. The deal does set out a “mechanism for resolving disputes.” If Iran chooses to exercise it, it will be seen as a sign that it is not yet ready to slam the door on the deal. The follow-up committee for the deal, which includes all the signatories, would tackle the crisis, with talks rising to the level of foreign ministers of the signatory countries. If no solution were to be found, a committee of three arbitrators would be formed and given two months to deal with the crisis before Iran decides if its obligations under the deal have lapsed.